Is that, because in English, there is no 'proper' translation for 'verkeersbord' ? I think the English words 'traffic sign' and 'road sign' both mean 'verkeerbord'. I don't know of a word that groups 'traffic sign', 'traffic lights' and 'road marking' like 'verkeersteken' in Dutch. Yes, that's because the OSM key "traffic_sign" is defined differently from the general English term "traffic sign". In the context of OSM, "traffic_sign" represents only those objects which are true signs (ie. a board), and the other objects are represented by different tags (e.g. highway=traffic_signals, highway=crossing, etc.). OSM vocabulary doesn't always match the vocabulary used outside of OSM, and that isn't necessarily a problem. Are you posting this in order to propose shifting things around within the OSM ecosystem to match external language definitions, or are you just posting this for the sake of pointing out the inconsistency? Many OSM contributors are already aware of the difference between OSM language and everyday language. It certainly can be confusing for someone new to the OSM ecosystem, but unfortunately it's necessary. While it might be nice to have keys and values that match plain language usage in various languages, that would be very hard to use by data consumers. For example, rather than a data consumer processing only highway=* tags, they might also have to process road=*, rue=*, straat=*, etc., all which would represent the same real-world objects. That would quickly become nearly impossible to use. That's why we come up with standardized keys and values, with definitions of what each means within the context of OSM. If that is the only 'problem' ,... the 'data consumer processing' ... then , if each tag has a unique correct ('outside-world') ID with wikidata, then there would be no 'problem' for the data consumer processing, because all the info/languages/etc. of a specifique item is in that unique wikidata ID ... isn't it ? And talking about 'correct' wikidata tag ... is this then correct ? If you use the presets of the editors in your native language you will not be confronted with the underlying DB keys/values. Mapping tools use as StreetComplete hide the actual key/value completely for the mapper. OsmAnd does this too to a certain degree. IMHO, you spend way to much time analysing each and every key and value. To understand the meaning of a key or value in OSM, you should read the OSM wiki, not Wikipedia, nor Wikidata. OSM might use a definition that is different from Wikipedia (e.g. for building). After reading the wiki, accept the key/values that are defined there. Do not try to come up with something different for things that are used thousands of times, just because there might a a slightly better word. That's a waste of time, time that can much better be spend on surveying and mapping. We need to categorize all objects we want to map. The definition of those categories is as 'clear and unambiguously' written in our own documentation, the OSM-wiki. We could number these categories like most GIS systems, but that would be hard to work with. Therefore we name those categories. The boundaries between categories that we define (OSM-wiki) do not exactly have to match the boundaries between categories that the names have (like on Wikipedia/Wikidata). Therefore you have to look for the definition at the OSM-wiki, not at Wikipedia or Wikidata. Exactly matching our categories to the definition of the word would be really hard and it is maybe impossible. Firstly we could have a category that does not exactly match a word. Secondly the definition of words is also different for each region and language. On OSM we call a footpath a highway, but this is very strange for everyone outside the UK, even English speakers like Americans. If you look at the problems governments have in writing laws that do what they want to do, you will realise that there is no way of giving totally unambiguous meanings to terms much more complex than the natural numbers. If you look then at what you say, the OSM-wiki, why is then this 'issue' emerged ? There is yet no description of 'onderbord'(supplementary plate) or 'AFTG' in OSM wiki. I just made a wikidata of it. I also added some descriptions of 'onderbord' in wikidata (feel free to 'correct' this ) ... 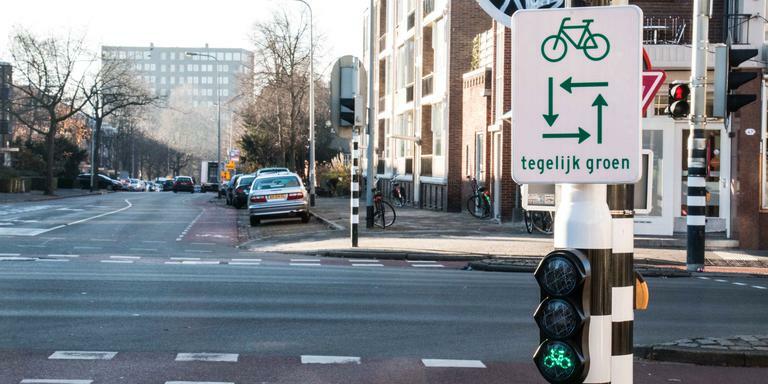 I did this , because there is going to be a 'official' Belgium Highway Code (in the near future) about 'Alle Fietsers Tegelijk Groen (AFTG)' , and some traffic lights have those 'squared-green-arrows' IN the light, but some have a 'supplementary plate' to mention that . In Groningen (Netherlands) is it also. I think the person who translated this, didn't use the OSM-wiki but a dictionary or more American English based own knowledge. The OSM-wiki clearly says that highway=trunk should be an 'autoweg' instead of a 'autosnelweg'. By the way I don't know where those translation tables are stored. There are similar translation errors when using this option on osm.org. Like a place=suburb translating to 'buitenwijk' instead of 'stadsdeel' while the OSM-wiki clearly says that suburbs are no American-type suburbs at the edge of the city (like 'buitenwijk'), but can also be in the city centre (like 'stadsdeel'). Or a highway=construction translating to 'snelweg in aanbouw' instead of 'weg in aanbouw', while the OSM-wiki says that a highway doesn't have to be a main road, like in American English. By the way I don't know where those translation tables are stored. I surely would like to know how/where to fix those translation errors. I think you would be quite lucky to find a web-site developer on this forum. Typically this sort of thing is done using .po files, if the programming language used supports them. These give the English text for every message and the corresponding translation. If one is wrong there may be many wrong, so it probably worth finding an reviewing the whole file. If it has been done this way, translating them doesn't require any programming skills. Although I assume they will be somewhere like github, I'd have to search to find them. I translated those as you said. Are there other 'issues', you know of, like that ? Aangemeld als vertaler maar hoeveel proefvertalingen moet ik maken voor dat ik echt mag gaan vertalen? Het zijn niet eens OSM-vertalingen die ik nu 'moet' doen. edit: Laat maar, ik heb dat kinderachtige gedoe afgesloten. Apologies for my language and emotional reaction. I got frustrated by their login process and forgot that I was on an English forum when I posted this message. Still frustrated by the way for now.